Habitat: Open woodlands and forest edges; farmlands, orchards, and fields; cities and towns. Wintering flocks seek sheltered woods for roosting and feed on nearby fruit-bearing trees. Diet: Earthworms and snails; caterpillars, beetles, and other insects; spiders; wild and cultivated fruits and berries. 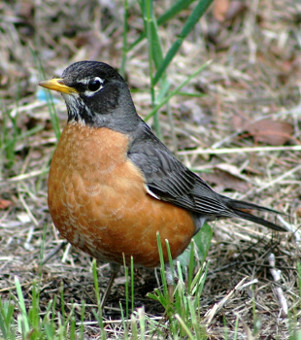 American Robins breed throughout New England. In the winter, many birds - especially in far northern New England and Canada - will move southward or to a lower elevation, unless food is abundant in their breeding range. 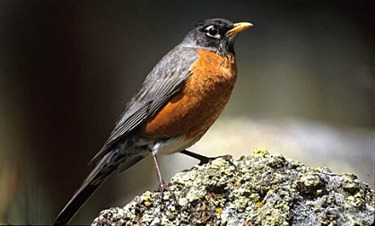 Some robins found in New England in the winter have migrated south from Canada while others are year-round residents. Robins tend to gather in flocks in the winter and go in search of fruit and berries left on trees and bushes. When breeding season begins, the flocks break up and the birds become more territorial. That's the time when you tend to see individual robins pulling worms on your lawn again.